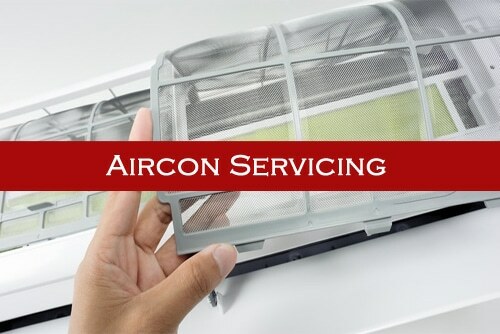 Wei Wei Aircon provide a wide range of aircon services in Singapore and we believe that we are able to meet all your aircon needs in Singapore. We understand that air-conditioner should provide strong and cool air to our home and office, but it is important that the air is also clean and healthy. This is where regular aircon servicing is required to keep your unit clean and in good working condition. If you are looking for qualified and reliable aircon services in Singapore, feel free to contact us. We provide qualified and professional aircon servicing in Singapore. It is one of the popular service that is engaged by households to upkeep their air-conditioner. By having regular servicing will keep your air-conditioner in good working condition, increase efficiency and improve the airflow of your units. Our comprehensive general air-conditioner servicing is able to clean your units, remove dust and dirt that have accumulated around your units. With the rising heat in Singapore and the extensive use of air-conditioning system, it is important to get your units regularly serviced. Hence, if you want to have your air-conditioner cleaned and serviced professionally, engage in our aircon servicing today. Another benefits of engaging our services is that during servicing, our technician will perform basic checks on your air-conditioner. This includes checking the electrical parts and components such as the motor and mechanical parts which are essential in the operation and cooling features of an air-conditioner. Regardless, you are looking for aircon servicing for residential, commercial or industrial premises, we are able to provide you with qualified and quality services. If you would like to find out the general aircon servicing price for your air-conditioner units, do not hesitate and call us today. Other than providing a comprehensive aircon service for our customers. We believe that the quality of the service and experience plays an important role in providing satisfactory service in Singapore. You can find out more about our general aircon servicing and feel free to contact us to book for an appointment today. 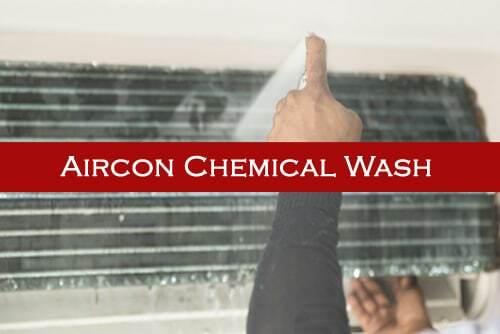 You may wonder that since general aircon servicing and maintenance already include servicing and cleaning of your air-conditioner, so why do you still require a chemical wash? Aircon chemical wash is a more thorough cleaning service as compared to general servicing. It involves thorough chemical washing of your air-conditioner. It is normally required for older air-conditioner units or air-conditioner units that is very dirty due to the build-up of dust, dirt and debris. By chemical washing aircon, you are able to wash out all this debris, dirt, dust and even mold or bacteria that have accumulated in your units. This will regain the functionality of your air-conditioning system and ensure a cleaner and healthier air, stronger airflow and increase the efficiency of your units. Hence, if you feel that your aircon is full of dirt and dust or your aircon is too old, you may require an aircon chemical wash. If your air-conditioner is not being regularly serviced in a long period of time, it is advised to do an aircon chemical wash to improve the condition and functionality of your air-conditioner. We offer aircon chemical wash to all residential, commercial and industrial premises. Therefore, if you would like to find out about our aircon chemical wash price in Singapore, kindly contact our staff to find out more about our services. In our aircon chemical wash service, we will flush and wash the different parts of the aircon with quality chemicals, this will flush out all the dirt, dust and debris that have accumulated in your air-conditioning unit. Chemical wash is one of the most effective cleaning services in Singapore which will effectively regain the cooling functionality of your units and regain the condition of your air-conditioner. If you have family members that have allergies or illness such as asthma, by chemical washing, it is able to help to improve the condition by removing and cleaning the stale and unhealthy indoor air that is being breathed by you and your family which is produced by your air-conditioning system. Find out more about our aircon chemical wash in Singapore. 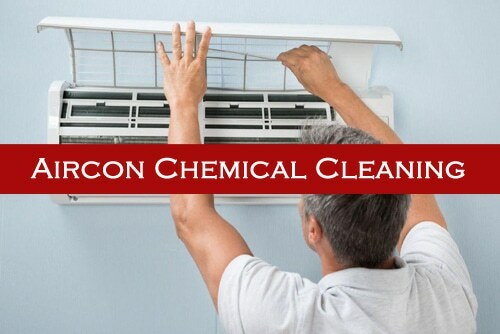 Aircon chemical clean in Singapore is another aircon services provided by us. It is an effective cleaning service that is able to maintain and clean your air-conditioning units. We are able to provide chemical cleaning aircon service on different parts and components in your air-conditioning system. If your air-conditioner is not serviced for a period of time and there is dirt or dust accumulated, you may require a chemical cleaning service. This will help to remove any dirt, dust, grease or debris that has build-up on your air-conditioner. By having regular a chemical cleaning, you can have a healthier and cleaner air-conditioning system. By having regular chemical cleaning aircon service in Singapore, you will enjoy cleaner air-conditioner, increase cooling efficiency and improve air quality. Find out more about the difference between aircon chemical cleaning and aircon chemical wash.
With years of experience in the air-conditioning field, our qualified and trained technicians are equipped with expertise, knowledge and experience in repairing your air-conditioner. 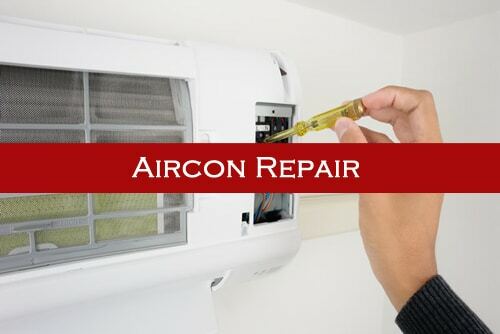 Regardless, you are looking for aircon repair for your residential, commercial or industrial air-conditioner units, we are able to meet your needs and repair your air-conditioner efficiently. Other than that, our experienced technicians are able to repair different types of aircon, brands and models. When your air-conditioning system is being regularly serviced, it can reduce the chances of breakdown or malfunction issues on your units. A malfunctioned air-conditioner is not uncommon in Singapore, but when it happens, it can cause your house or room to be extremely stuffy and hot which is unbearable. Other than being uncomfortable in a hot room, it could even lead to health issue such as heat rashes or other illness. Thus, when your aircon units start surfacing problems or issues, you should get it checked by professional aircon technicians and get it rectified immediately. This will prevent the worsening of the problems and avoid any health or safety complications. When your air-conditioning system is facing problems and in the midst of breaking down, you can contact our professional technicians to take a look at your air-conditioner. Contact our friendly staff to find out more about our aircon repair service and book an appointment with us to repair your aircon today. By engaging our aircon repair service, our experienced technicians will check, troubleshoot your units and they will also evaluate and diagnose the cause of your aircon problem that you are facing. After that, our technicians will provide the most economical solutions and the repairs that are required, as well as the cost of it. We believe that with our knowledgeable and experienced technicians, we are able to repair your air-conditioning and get your units back to working conditioner in an efficient manner. If your air-conditioner is facing any problems which is disrupting the normal operation of your units, you can contact us and our friendly technicians will be able to assist you by providing quality aircon repair services and rectify your problems. Find out more about our aircon repair service. Regular aircon servicing maintenance contract is an important service to upkeep your air-conditioner with the rising heat in Singapore. With the hot and stuffy weather in Singapore, regular servicing and maintenance can help to keep your units in good working condition and maximise its efficiency. Furthermore, by having an aircon maintenance contract, you not only able to enjoy the benefits, but you are able to save costs as compared to ad-hoc general aircon servicing. Firstly, having a maintenance contract for your air-conditioning system means that your units will enjoy regular servicing. By having regular servicing and maintenance, you will keep your aircon clean which will improve the air quality, allowing you and your family members to inhale clean and healthy indoor air in your home. Secondly, regular maintenance can help to improve the airflow and the efficiency of your air-conditioner units. Thus, you will enjoy cooler and stronger air when your units are serviced. Other than that, it will increase the efficiency of the system which will result in lower energy consumption and help you to save on your energy bills. Thirdly, it will give you a piece of mind as you know that your aircon is in the good hands of professionals. Furthermore, knowing that your air-conditioner units will have a lower possibility of facing sudden breakdown problems due to the regular maintenance will take off some burdens off your shoulders and allow you to enjoy the cooling air. Lastly, by having regular servicing yearly contract for your aircon, it will bring down the price of your overall maintenance cost. Thus, allowing you to enjoy the cool air while not hurting your pockets. The more air-conditioner units you have, there will be greater discounts given. For companies looking for aircon maintenance servicing package for their office or warehouse, you can send us an email or contact our friendly staff. With regular servicing contract for your aircon, you are able to ensure that your units are in proper hands and in good working condition. Other than that, it gives you peace of mind since you know your units is being taken care by professionals and are being cleaned and regularly serviced. We understand that different households or companies will have different air-conditioning needs which is why we are able to customise and tailor an aircon maintenance servicing package to suit your needs. You can find out more about our servicing package by sending an enquiry with the aircon maintenance contract package that you or your company is interested in. We are confident that we are able to tailor a maintenance contract package that is able to meet your air-conditioning servicing needs. 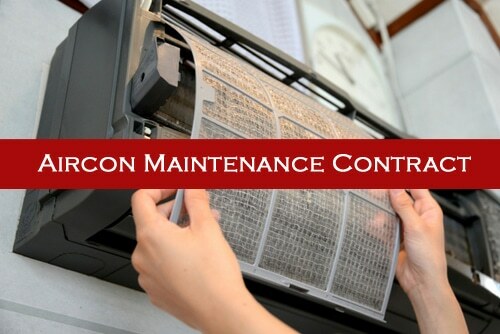 Find out more about our aircon maintenance contract in Singapore. If you like to know more about our servicing maintenance contract package price, you can contact our friendly staff. Are you planning to move to a new house or planning to renovate your home or office and is looking for new air-conditioners installation? Wei Wei Aircon provide quality aircon installation in Singapore. We carry a wide range of aircon brands such as Daikin, Mitusubishi Electric, Panasonic, Fujitsu, York and many more. We also offer installation for different types of air-conditioners such as wall mounted aircon unit, ceiling cassette aircon unit, window aircon unit, casement aircon unit and much more. Choosing a reliable and professional air-conditioner installation company is very important in ensuring a properly installed and working air-conditioner. This will save you on the future problems that may happen in the future due to a poorly installed unit. A poor aircon installation will cause unnecessary troubles and problems in the future, such as water leakage, gas leakage, aircon not cold or other issues. Hence, it is essential to choose a reliable and a professional installation company to install your air-conditioning units. Other than providing aircon installation to residential premises, we also provide air-conditioning installation to commercial and industrial premises. With our qualified and professional installer, we are confident in installing the right air-conditioner units for your home or office. If you are unsure of which air-conditioners is suitable for your home or office, do not worry as you can engage our staff and they will recommend the most suitable air-conditioner based on your requirements and aircon needs. 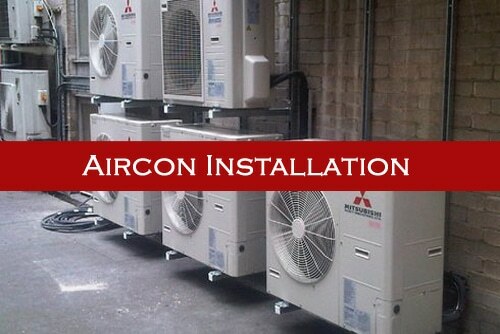 We also provide installation for inverter and non-inverter type of aircon system in Singapore. If you would like to know more about our aircon installation price in Singapore, feel free to contact our staff for more information. Find out more about our aircon installation in Singapore. Aircon refrigerant gas top up in Singapore is not uncommon in Singapore. When you find out that your aircon need gas top up, it may mean that there could be some issues with your air-conditioner. Thus, we will always carry necessary freon gas equipment’s with us when performing servicing or repair jobs in order to check for possible refrigerant issues on your aircon units. 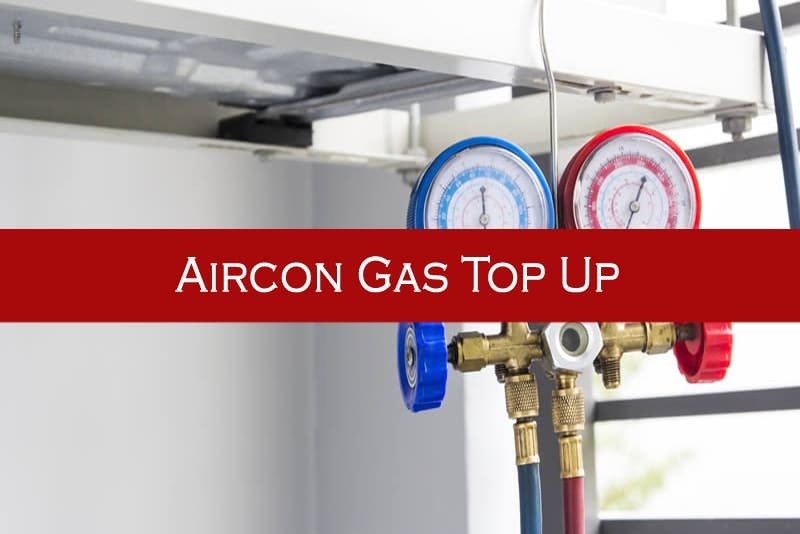 If you found out that you require aircon refrigerant gas top up, our technicians are able to perform the gas top up for you during the servicing. At the same time, our technicians will check your air-conditioner, assess the condition and check if there are any parts or components requires repair. However, do not worry if your aircon requires gas top up as if there are any issues, our staff will be able to advise and rectify the issue for you. When you feel that your aircon is not cold anymore, this may indicate that you require topping up of aircon gas. There are also other symptoms that you may encounter that indicates that you require a refrigerant aircon gas refill. If you require refrigerant aircon gas top up in Singapore, you can contact our friendly staff to find out the price of aircon refrigerant gas top up. Have you ever been in a situation where you have encountered aircon problems such as aircon not working, aircon not cold or aircon blowing hot air, but you do not know what the cause of it is? This is where aircon troubleshooting service comes into place. By engaging our troubleshoot service, our technicians will assess the aircon, identify the aircon problem and advise on the possible repair jobs or solutions to rectify the issue. Do not worry when you are facing aircon problems as certain problems can be easily resolved with the appropriate equipment and tools. It is important to take note that individuals that try to attempt to repair or fix the air-conditioner on their own may cause their warranty to be voided. In addition, without proper knowledge, experience and tools, you may end up damaging the air-conditioning units instead of fixing it. Therefore, when you encountered any aircon problems, you should engage our professional and experienced technician and we will perform quality troubleshooting service and assess the condition of your air-conditioner. In addition, our trained technicians are able to troubleshoot and repair most aircon brands and models in the air-conditioning industry. Hence, if you need troubleshooting aircon service in Singapore, you can contact our friendly staff to book an appointment with us. When you engage our troubleshooting service, our technicians will also provide advice on the solutions to get your aircon problem rectified and repaired. 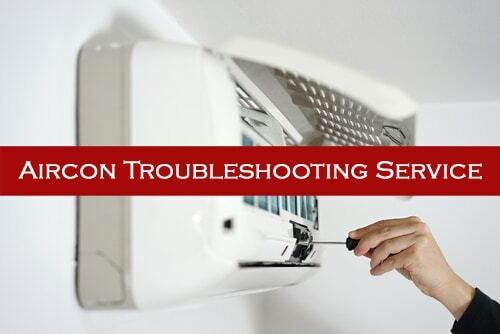 It is important to troubleshoot and diagnose your aircon problems immediately when you are facing one. If you ignore the issue and continue operating your air-conditioner, it could worsen the issue and even result in breakdown issues. This could cause you additional hefty repair cost to get your units working again. This is why you should get your units checked thoroughly and immediately when you facing any aircon issues. If you like to know our aircon troubleshooting service price, please contact our staff for more information. With more than 20 years of experience in the air-conditioning industry in Singapore, we are confident that we are able to provide qualified and quality aircon services to our customers. With our wide range of aircon services, we aim to be your one stop aircon services company in Singapore. Furthermore, our well trained and experienced technicians are able to meet all your air-conditioning needs and allow you to be “worry-free” and enjoy the cool air while we do the jobs for you. As mentioned above, performing aircon repair or maintenance can be a complicated job as it requires appropriate knowledge and tools to properly handle the units. Hence, it is advised to have qualified technicians to perform the task for your units. Wei Wei Aircon provide a wide range of aircon services such as aircon servicing, chemical wash, repair, maintenance, installation and many more. We aim to be your one stop aircon services company and by engaging our services, we ensure that your units will be in good working condition and are able to operate smoothly. If your aircon is full of dirt, dust or debris, we offer a cleaning service that is able to thoroughly flush out all the dirt, bacteria, and other harmful substances in your air-conditioner unit. This will ensure that your air-conditioner is thoroughly washed and is clean which is able to improve the cooling efficiency of your system and improve the airflow of your unit. If you require any of our air-conditioner services in Singapore, you can contact us. Our friendly staff will be able to assist you in your aircon needs in Singapore.